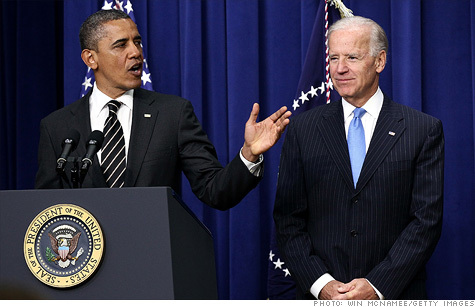 The White House released 2011 tax returns from President Obama and Vice President Joe Biden on Friday. NEW YORK (CNNMoney) -- President Obama and the first family saw their income drop by almost $1 million in 2011 as sales from his best-selling books slowed. Jay Carney, the White House press secretary, noted in a statement that Obama's 2011 effective federal income tax rate is 20.5%, and that the president's own policies would result in higher taxes for the Obama family. The president earns a salary of $400,000 for his day job. His total earnings are much higher because his books -- "Dreams From My Father," and "The Audacity of Hope" -- continue to attract buyers. Vice President Joe Biden and his wife Jill reported income of $379,035, but gave only $5,540 -- or 1.4% -- to charity. The release comes at the end of a week in which the Obama campaign made a concerted push for the so-called Buffett Rule, a tax law change that would force some of the richest Americans to pay more. That proposal is expected to come up for a vote in the Senate next week, but has no chance of being approved by the Republican-controlled House. That won't stop the White House from harping on the issue, which complements the Obama campaign's efforts to portray Obama's Republican challenger, Mitt Romney, as out-of-touch, and very wealthy. According to an already released estimate of Romney's 2011 taxes, the former governor of Massachusetts earned $21 million last year and will have a tax bill of $3.2 million. Romney has also released his tax data for 2010. Combined, the returns show that Romney made $42.7 million over the past two years and paid $6.2 million in taxes. That means Romney paid a much lower effective tax rate -- around 14.5% -- than the Obamas, while earning substantially more income. Andrea Saul, a spokeswoman for Romney, said that the campaign will release the candidate's finalized 2011 return "when it is filed." She declined to say when that might be, but the final day to file taxes without an extension is Tuesday. Democrats have called on the campaign to release returns from additional years, citing the precedent established by Romney's father George, who released 12 years of taxes when he ran for president in 1967. The Obama campaign struck that chord again on Friday, openly speculating in a written statement about the secrets that Romney's returns might contain. "What does he have to hide?" the statement asked. "Governor Romney may try once again to play by his own set of rules, but Americans will hold him accountable for trying to hide his record." The rhetoric was not one-sided. Even before the release of Obama's returns, the Romney campaign accused the White House of creating a "distraction." "It's no surprise with the worst job creation record in modern history that President Obama would try to distract Americans from the real issues with a series of sideshows," Saul said in a statement issued to CNN.